The Sopwith 7F.1 Snipe was a British single-seat biplane fighter of the Royal Air Force (RAF). It was designed and built by the Sopwith Aviation Company during the First World War. In early 1917, Herbert Smith, the chief designer of the Sopwith Company, began to design a fighter intended to be the replacement for Sopwith's most famous aeroplane, the highly successful Sopwith Camel. Prototype Snipes had a number of minor technical problems. In particular, maximum speed was initially well below expectations. In fact, the Snipe was never a fast aeroplane, even for its day. The Snipe's structure was rather heavier, but much stronger, than earlier Sopwith fighters. Although not a fast aircraft for 1918, it was very maneuverable, and much easier to handle than the Camel, with a superior view from the cockpit - especially forwards and upwards. The Snipe also had a superior rate of climb, and much better high-altitude performance compared to its predecessor, allowing it to fight Germany's newer fighters on more equal terms. Further modifications were made to the Snipe during the war and post-war. The Snipe was built around the Bentley BR2 engine - the last rotary to be used by the RAF. It had a maximum speed of 121 mph at 10,000 ft compared with the Camel's 115 mph (185 km/h) at the same altitude and an endurance of three hours. Its fixed armament consisted of two 0.303 in (7.7 mm) Vickers machine guns on the cowling, and it was also able to carry up to four 25 lb (11 kg) bombs for ground attack work, identical to the Camel's armament. The design allowed for a single Lewis gun to be mounted on the centre section in a similar manner to those carried by the Dolphin - in the event this was not fitted to production aircraft. The Snipe began production in 1918, with more than 4,500 being ordered. Production ended in 1919, with just under 500 being built, the rest being cancelled due to the end of the war. 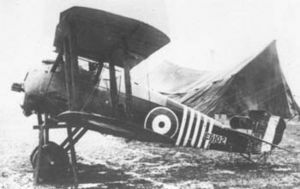 There was only one variant, the Snipe I , but production was by several companies including Sopwith, Boulton & Paul Ltd, Coventry Ordnance Works, D. Napier & Son, Nieuport and Rushton Proctor & Co Ltd.
Two aircraft were re-engined with a 320 hp (239 kW) ABC Dragonfly radial engine and these entered production as the Sopwith Dragon. An armoured version entered production as the Sopwith Salamander. In March 1918, an example was successfully evaluated by No.1 Aeroplane Supply Depot (No.1 ASD). Lieutenant L. N. Hollinghurst (later an ace in Sopwith Dolphins, and an Air Chief Marshal) flew to 24,000 ft in 45 minutes. The new fighter went to France with No. 43 Squadron in September 1918. The Snipe also saw service with No. 4 Squadron Australian Flying Corps (AFC) from October 1918. and No. 208 Squadron RAF converted from Camels in November, too late for the Snipes to see action. The Canadian Air Force (CAF) operated the Snipe after the war, but it was phased out in 1923, a year before the Royal Canadian Air Force (RCAF) was formed. The Snipe proved to be a potent fighter despite its brief involvement in the war, performing a variety of duties. One of the most famous incidents in which the Snipe was involved, occurred on 27 October 1918 when Canadian Major William G. Barker from No. 201 Squadron RAF flew over the Forx�t de Mormalin France. Barker's Snipe (No. E8102) had been brought with him for personal evaluation purposes in connection with his UK-based training duties and was therefore operationally a "one-off". The engagement with enemy aircraft occurred at the end of a two-week posting to renew his combat experience as Barker was returning to the UK. While on his last operation over the battlefields of France, Major Barker attacked a two-seater German aircraft and swiftly shot it down. However, Barker was soon attacked by a Fokker D.VII, which after some resistance, was shot down by the Canadian. Barker, by himself, was subsequently attacked by a formation of about 60 D.VIIs, an aircraft widely considered to be the ultimate German fighter design of the First World War. In the engagement, Barker was wounded three times, losing consciousness momentarily on each occasion. The ensuing melee was observed by many Allied troops. The final combat report of the incident (not written by Barker, due to his injuries) lists claims for three enemy aircraft (although four are referred to in the citation for his Victoria Cross). Barker managed to return to British lines safely where he crashed his Snipe. The Snipe gained a significant number of combat victories in its short operational history during the war. In 1919, the Snipe also took part in the Allied intervention on the side of the White Russians during the Russian Civil War against the Bolsheviks. A small number of RAF Snipes were actually captured by the Bolsheviks and pressed into service. Selected as the standard postwar single-seat fighter of the RAF, the last Snipes were retired by that service in 1926. No. 4 Squadron AFC in France. Franks, Norman. Dolphin and Snipe Aces of World War I (Aircraft of the Aces). London: Osprey Publishing, 2002. ISBN 1-84176-317-9. Sopwith Snipe Pictures and Sopwith Snipe for Sale.